To a Catholic the belief that marriage is a sacrament, and is between one man and one woman is essential. To many others, marriage can easily be re-defined, and living together before marriage is no big deal because everybody is doing it. It’s important to know history, know why we are Catholic, and embrace the beauty and truth of our faith. 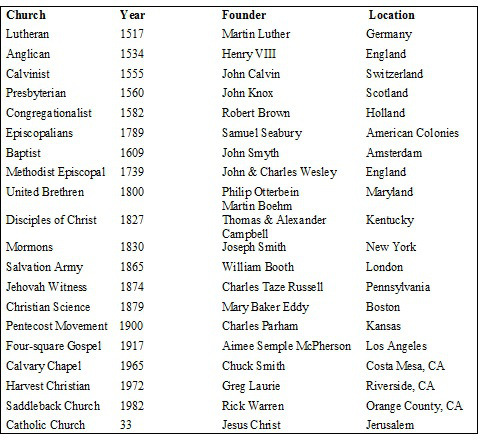 So many people, including many protestant pastors, converted to the Catholic Church after studying Church history, particularly regarding the issue of authority. Two great books to read on church history are: “Four Witnesses”, by Rod Bennett, and “Where we got the Bible: Our debt to the Catholic Church” by Henry Graham. Two great sites that have helped many people on their journey to the Catholic faith are Catholics Come Home –www.catholicscomehome.org. and The Coming Home Network – http://www.chnetwork.org. Catholics do not worship statues . . .
Do Catholics worship statues or images? Catholics use statues, paintings, and other artistic devices to recall the person or thing depicted. Just as it helps to remember one’s mother by looking at her photograph, so it helps to recall the example of the saints by looking at pictures or statues of them. Catholics also use statues as teaching tools. In the early Church they were especially useful for the instruction of the illiterate. Many Protestants have pictures of Jesus and other Bible pictures in Sunday school for teaching certain people and have three-dimensional nativity scenes at Christmas. God forbids the worship of images as gods, but he doesn’t ban the making of images. If he had, religious movies, videos, photographs, paintings, and all similar things would be banned. It is when people begin to adore a statue as a god that the Lord becomes angry. Thus when people did start to worship the bronze serpent as a snake-god (whom they named “Nehushtan”), the righteous king Hezekiah had it destroyed (2 Kgs. 18:4). Think about Mt. Rushmore, the Lincoln Memorial, the 911 Memorial in New York, and all the statues in Washington D.C. and around the world. People go to see these statues and stand in front of them, sometimes bow their heads in prayer, or stand their staring at the statue or piece of marble in awe. Does this mean these people are worshiping these statues? Absolutely not. Since many Catholics sometimes bow or kneel in front of statues of Jesus and the saints, many non-Catholics confuse the legitimate veneration of a sacred image with the sin of idolatry. Catholics do not believe their statues, made of plaster, are God. A statue, or any other piece of religious art, is intended to draw the soul deeper into prayer by helping the senses to recall the mystery that it represents. Crucifixes, a statue of Mary or stain glass windows help for a soul to meditate and contemplate the great mysteries of God. Though bowing can be used as a posture in worship, not all bowing is worship. In Japan, people show respect by bowing in greeting (the equivalent of the Western handshake). Similarly, a person can kneel before a king without worshiping him as a god. In the same way, a Catholic who may kneel in front of a statue while praying isn’t worshiping the statue or even praying to it, any more than the Protestant who kneels with a Bible in his hands when praying is worshiping the Bible or praying to it. 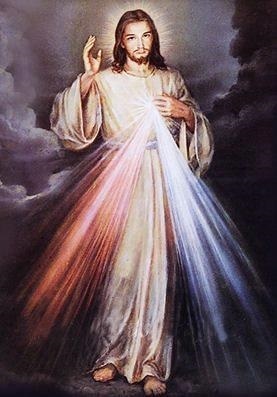 Common sense tells us that, since God has revealed himself in various images, most especially in the incarnate Jesus Christ, it’s not wrong for us to use images of these forms to deepen our knowledge and love of God. That’s why God revealed himself in these visible forms, and that’s why statues and pictures are made of them. The Church absolutely recognizes and condemns the sin of idolatry. What non-Catholics fail to recognize is the distinction between thinking a piece of stone or plaster is a god and desiring to visually remember Christ and the saints(who are alive in heaven, not dead) by making statues in their honor. The making and use of religious statues is a thoroughly biblical practice, and a beautiful way to deepen your faith and grow closer to Christ. 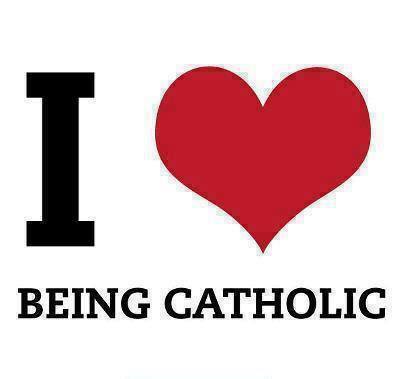 No, but like Jesus we love, honor and venerate His blessed mother. 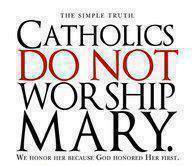 The Catholic Church has never worshiped Mary, and never will. Catholics worship God and God alone. Heaven is not a “dead” place. Catholics believe people in heaven are very much alive. (Mat 19:29, 25:46, 10:17-22, Mk 10:30, Lk 10:25-30, Lk 18:18-30, Jn 3:15-16). We think Mary is totally alive, and is praying for us the way a faithful pastor would pray for his congregation, except much more so. She’s interceding for the unborn, for mothers contemplating abortion, and for many others who are experiencing sorrows in our world, and who want to grow closer to Jesus. Why do we as Catholics honor, love and venerate her so deeply? We love Mary first of all because Jesus did. As Saint Maximilian Kolbe said, “Never be afraid of loving the Blessed Virgin too much. You can never love her more than Jesus did.” What better way to imitate Jesus than to love His mother? Catholics do not put Mary on par with God. Mary is certainly worthy of reverence, but not worship. Catholics believe that Mary is the highest of God’s creatures because of her exalted role. Yes – Mary, a woman, is considered by Catholics to be one of God’s greatest creations. The Holy Trinity chose Mary, from all eternity, to be the mother of Jesus. But of course, like any other human being, Mary had to be saved by the mercy of God. She herself said, “My spirit rejoices in God my Savior” (Lk 1:47). We believe that God saved her by taking away all stain of original sin at the moment of her conception (the Immaculate Conception). The very fact that God took on flesh and became man (Jn 1:1, 14) indicates that He wished to involve human beings in His plan of salvation for mankind. Mary was a key person for this purpose, so this is why Catholics honor her so highly. The Hail Mary is not a prayer of worship, but it is a recitation of Scripture and then an asking of her to pray for us to God; much like asking our other Christian brothers and sisters to pray for us. The rosary (Saint John Paul II’s favorite prayer), is a Christ-centered prayer. It is like holding the hand of Our Blessed Mother and walking through the gospels and she leads us gently to her Son. The Gospel of Luke 1:48 says, “Behold, from now on will all ages call me blessed.” Any time the Bible uses the word “behold” it means pay attention because what is about to be said is very important. In Luke 1:42 Elizabeth calls Mary “Most blessed among women” Mary is ‘most blessed among women’ and ‘highly favored’ by God. Elizabeth also refers to Mary as the “Mother of my Lord.” How many other people in Scripture have received such designations? None. Mary knew she was called by God to be the Mother of Jesus. If Jesus chose to be born into this world through Mary how much more do you and I, “all generations”, need her to help us draw closer to Christ in our daily lives. What human on earth knew Jesus best? His mother. Mary’s sole purpose is to bring us closer to her son. You honor Jesus more by loving His mother. Think about it, if Mary had any other children, it would have been scandalous in Jewish culture for Jesus to entrust Mary to a friend. Jewish tradition was for a child to care for a widowed mother, not a friend. From the cross when Jesus uttered, “Behold your mother” (Jn. 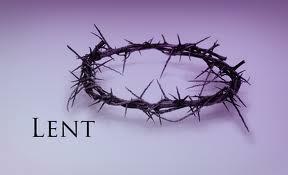 19:27), she became not only the mother of John, but of all whom Christ redeemed through the crucifixion. She is the mother of the Church – the mystical body of Jesus. Since Mary is Jesus’ mother, it must be concluded that she is also the Mother of God. (Jesus is God.) Although Mary is the Mother of God, she is not His mother in the sense that she is older than God or the source of her Son’s divinity, for she is neither. Rather, we say that she is the Mother of God in the sense that she carried in her womb a divine person—Jesus Christ, God “in the flesh” (2 John 7, cf. John 1:14)—and in the sense that she contributed the genetic matter to the human form God took in Jesus Christ. Catholics believe Mary’s soul still “magnifies the Lord” for Christians of our generation who choose to relate to her. Currently, Catholics continue to honor, love and call her blessed, which was intended for all generations, and for all Christians. Our dear Blessed Mother, pray for us! 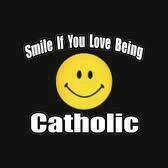 It matters because as Catholics we think it is important to belong to the Church that Christ founded 2000 years ago. It matters because when you leave the Catholic Church, you leave the Eucharist – and all the sacraments that Christ Himself instituted. It matters because as Catholics we believe the Church contains the fullness of the truth, because it was founded by Christ Himself. This does not mean that we think other religions and Christian denominations do not contain any truth, for they do. 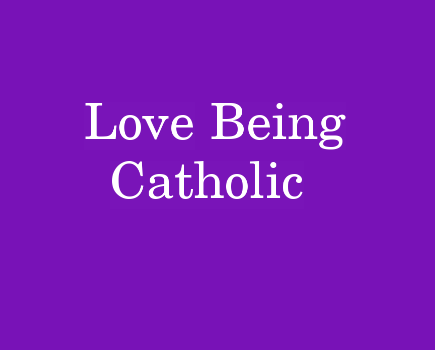 But the Catholic Church, since it was founded by Jesus, contains the fullness of truth, so we think it is very important to belong to the Catholic Church and share our faith with others. Does this mean that Catholics are holier than non-Catholics? Absolutely not. Some of the holiest people I know are Catholic, and some of the most unholiest people I know are Catholic. We’ve been given this beautiful gift of our Catholic faith, and yet too many of us have taken it for granted (guilty as charged!) or have not appreciated what we have. The Catholic Church, founded by Christ, contains the fullness of Truth. Be grateful for the beautiful gift of our Catholic faith, and then pass on our beautiful teachings and traditions to your children and grandchildren. If you don’t, who will?